There is currently a handful of genome sequences available for tailed bacteriophages with genomes of more than 200 kbp of DNA, designated here as giant or jumbo phages. The majority of the proteins predicted from the genome sequences of these phages have no matches in the current sequence databases, and the genomes themselves are diverse enough to preclude the sorts of detailed comparative analysis that has benefited study of the smaller phages, for which hundreds of genome sequences are available. However, it is informative to extrapolate the better known genome organizations and mechanisms of evolution seen in the smaller phages to the jumbo phages. In this way, we see that the jumbo phages encode the same functions as the smaller phages, supplemented with large numbers of mostly small genes of mostly undiscovered functions. 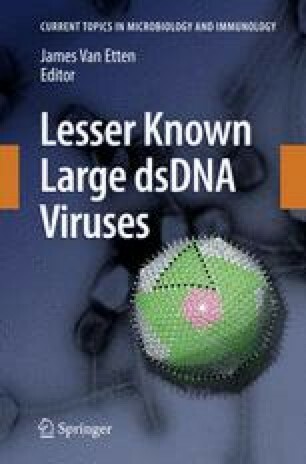 A case can be made that the jumbo phages evolved from smaller tailed phages, possibly in a process mediated by the constraints imposed on genome size by capsid size.